The famous artist Pablo Picasso created the famous sketch in 1955. This sketch has gained popularity among lovers of his work. 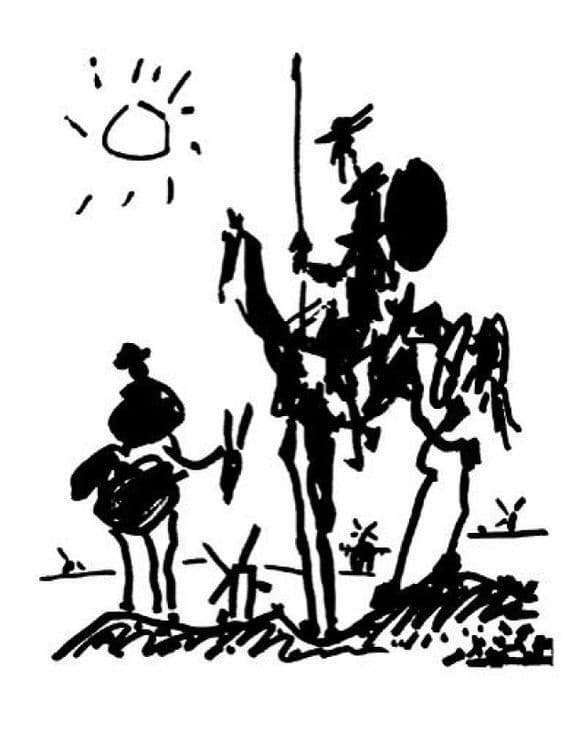 Picasso depicted in his famous painting Don Quixote on a horse, his friend Sancho Panza on a donkey, the sun and four windmills. He works very confidently and boldly, his lines are like black scribbles on a completely white sheet of paper. Sancho Panza, sitting on his donkey, looks at his tall friend, who is tired, exhausted and dear, looking into the distance. They have a rather noble posture, somewhat tired from a long journey. The body was most likely depicted several times, a helmet is on the head, a neck is drawn with one line, a sharp nose, a goatee. He has a spear in his right hand and a shield in his left. His friend Sancho Panza’s body is painted with an indefinite mass, in which a jacket is slightly visible. Picasso paid less attention to him, his main gaze was on Don Quixote. The drawing is bright, full of movement, emotions, clear lines. The picture is made in black and white, the ink placed on the paper speaks of the artist’s restless vigor, complete freedom, internally vigor. Black strokes made on white paper are surprising with bold, simple and clear tone, made with bold and light lines. Don Quixote and the windmill, located between him and his friend, made more bold lines, thereby emphasizing the importance of the figure. Sancho Panso and the other figures in the picture are lost in the background of the canvas. Picasso portrayed with dark elements, that which absorbed the mind of the protagonist, transformed from everyday to mystical. The horse, as an independent figure, windmill, land – all this found an unusual transformation in the thoughts of the hero.